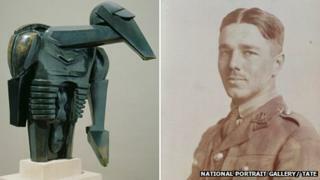 The centenary of World War I is to be marked in a National Portrait Gallery show of paintings, films and sculptures inspired by the conflict. The Great War in Portraits will run at the central London gallery from 27 February until 15 June, 2014. The exhibition will include two films made about the Battle of the Somme from different sides of the lines. It will also feature portraits of Sir Winston Churchill and war poets Wilfred Owen and Siegfried Sassoon. Paintings and photographs of soldiers decorated for bravery will be shown alongside prisoners of war, the wounded and those shot at dawn for cowardice. Major loans on display will include expressionist artworks by Lovis Corinth and Max Beckmann and Ludwig Kirchner's Selbstbildnis als Soldat - Self-portrait as a Soldier. Also on show will be portraits of the generals who plotted the course of the war and a photograph of assassin Gavrilo Princip whose murder of Archduke Franz Ferdinand triggered the conflict. Other highlights will include Jacob Epstein's The Rock Drill, one of the great early modernist works related to the war, and a rare photograph by Jules Gervais Courtellemont depicting a battle-scarred, deserted landscape. The gallery will host a range of activities linked to the centenary including two special performances by the Portrait Choir inspired by the war. Exhibition curator Paul Moorhouse said: "The Great War in Portraits explores a complex range of human experience. "Evolving different roles, responsibilities and destinies, it illuminates the way war was represented through portraits of individuals - each caught up in events beyond reason or control."